Anya Ulinich is a writer, graphic novelist, and visual artist. Author of two critically acclaimed books, including the novel Petropolis (Viking, 2007), her work straddles art and story, autobiography and fiction. 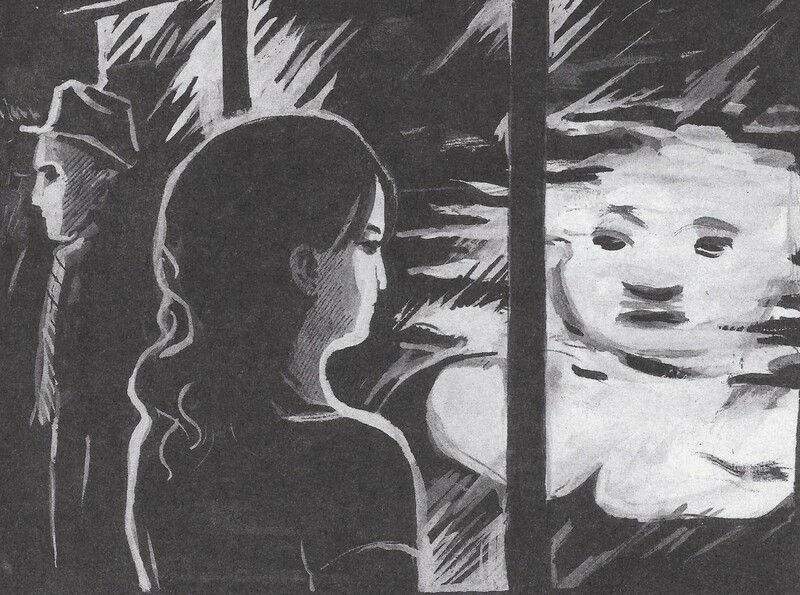 In her most recent book, the graphic novel Lena Finkle’s Magic Barrel (Penguin Books, 2014), Ulinich uses memory and imagination to tell the stories of a Solo Mom struggling with new loves and a new life in the United States, based loosely on Ulinich’s own struggles. She draws using a variety of perspectives and styles in Lena Finkle’s Magic Barrel and employs equal skill in her written work: she writes with humor and grace of her first marriage to the first man she ever dated in a piece published in the New York Times. (The paper later called her “a rare, indeed magical, talent.”) Born in Moscow, the classically trained visual artist emigrated to the United States when she was a teenager and lived in Arizona, Chicago, and California before settling with her two daughters in New York City. Q: What was your art training like? Q: So why did you start writing? A: I had no space to paint, and I wasn’t making it in the art world. I was getting nowhere. I didn’t know anybody, and writing was something I could do at night for a few hours at a coffee shop. To paint, I would have to get child care and a studio. Writing was a more compact form of keeping my brain alive. Writing became a mental escape—doing something creative and intellectual after a day of parenting. A: I didn’t decide to write a novel. I just started—and it got bigger and bigger. Q: How do you use memory in a graphic novel? Lena Finkle’s Magic Barrel has so many flashbacks—memory and the past is so important to the book. How do you indicate that in art? A: I drew the memory segments in a different style from the parts that are set in the present. The further back the memory, the more cartoony the drawing. Memory is cartoony: many details are forgotten, but some are exaggerated in remembering. Because of this, everyone remembers the same story or same event differently—it depends on what they were paying attention to at the time, what affected them most. Q: What were your biggest influences, as a visual artist or writer? What inspires your work? A: I have inspirations rather than influences. George Saunders. Alice Munro is my favorite writer of all time. [Leo] Tolstoy, [Anton] Chekhov, and Philip Roth. I read like a writer all the time. Right now, what’s inspiring is the writings of Ta-Nehisi Coates; Khaled al-Asaad, the retired archaeologist beheaded by ISIS in Palmyra [Syria]; the paintings of Natalia Laluq; [and] the paintings of Zoya Cherkassky. Q: How do you make time for being creative? Can you write or draw every day? A: I haven’t quite figured it out! My kids go to school at 7:30, and I don’t have to be at work until 10. I have a ton of interesting friends I get to see, so my mind is really always working. I’m trying to figure out how to be a writer around that in addition to being a mom. I can’t stand just looking at other people’s art; I have to make my own. Q: How do you balance it? A: Not well. I’m currently balancing motherhood, art, and a full-time day job. It’s a wonderful job, and I’m lucky to have it, but there isn’t much art being made at this time, and mothering sometimes consists of texting the kids to try to convince them to go buy some groceries or pick up the laundry—which they don’t like. Still, older kids are mostly easy, and we mostly have a good time. A: Yes; it will be a literary novel. It may have drawings in it, but drawing won’t be the primary medium. Q: Do you have any advice for writers or artists who are Solo Moms? A: Don’t give yourself a hard time. Make writing time, but it’ll come when it comes. When you have a child that is young, it feels like it will never end. But people are too hard on themselves. I’ll make work when I make work. Remember, friends can be a lifesaver. Read the excerpt below to find out why Lena Finkle’s Magic Barrel has been described as “the divorced woman’s Maus.” To order the whole book, go to Penguin.com.